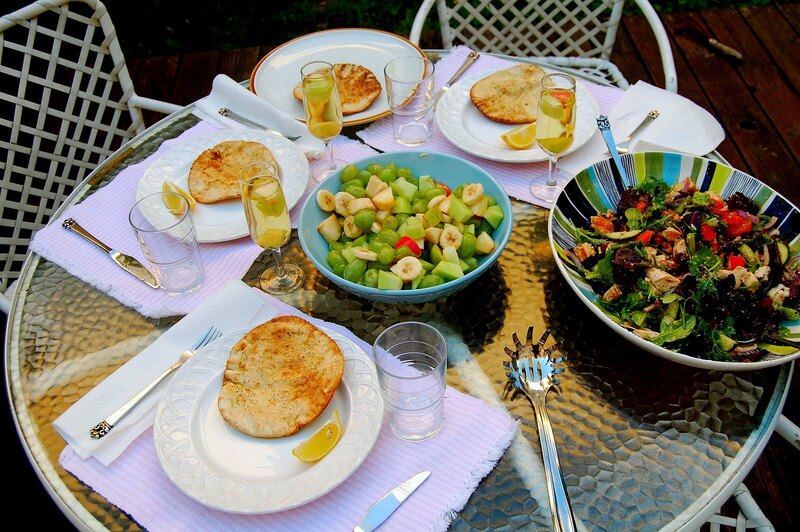 Last summer, I made a perfect Summer salad with my girlfriends. 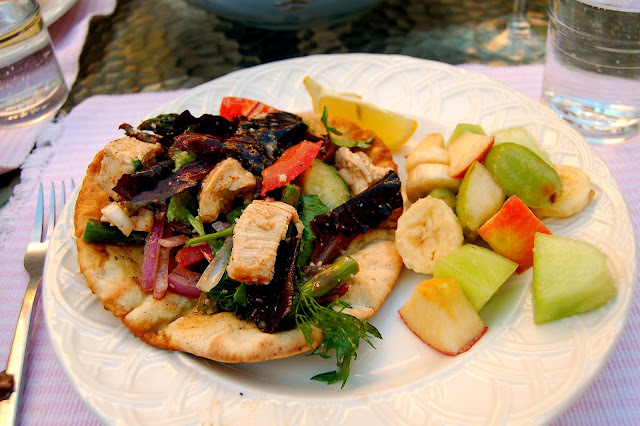 A chicken salad mixed with lots of vegetables and served over pita is a perfect way to end any hot (well there are not a lot) day in San Francisco. This recipe I just came up with on the fly with the ingredients that looked the best at the store. We also decided to make a fresh fruit salad! We placed some of the chopped fruit in Champagne Flutes and topped with cold white wine for fun! Fruit Salad tip: For a more "dessert like" fruit salad mix your favorite chopped fruits with Lemon Yogurt!!! Click on Read more for recipe>> below!! All pictures included in this post were taken by Niky. Visit her blog for more amazing photographs! Pitas: Brush Pitas with 2 tbsp olive oil, salt, and pepper. Toast in oven at 350 degrees for about 5 minutes, until slightly brown but not hard. Chicken: Heat 2 tbsp olive oil of medium high heat. Dry chicken breasts and season with salt and pepper. Pan sear until fully cooked. Let rest. Asparagus: Toss asparagus with 1 chopped garlic clove, 1 tbsp oil, salt, and pepper. Saute in pan over medium heat until al dente. Dressing: Mix 1 chopped garlic clove, chopped shallot, dijon mustard, salt, pepper, and red wine vinegar. Slowly mix in remaining olive oil. Salad: In large bowl mix lettuce with all vegetables. Cut chicken into 1/2" to 1" squares and mix in salad. Toss with dressing to taste. Serve over toasted pitas. Serve with lemon wedges for additional acidity.